Research for a Public Art project ‘Voices’ which touched on geological and glacial activity led my attention north to Iceland offering a unique opportunity to study geological and environmental information in a contemporary visual way. The land itself, continually scored by melting water from the ice caps, embodies the etching process, its vast landscapes are reflected in the scale of some of the paintings. Mar 2016 - Selected for Artists residency in Siglufjordur, Iceland in Mar 2016. Feb. 2016 - Whitehouse Gallery Kirkcudbright. Three person Printmaking exhibition with Kate Downie, Silvana McLean and Cat Outram. July 2015 - Actinic, Alternative Photography Festival at Edinburgh Printmakers Studio and invited speaker. April 2015 - Kulturschopfer, Green Hill Gallery Berlin, with Spring Fling. July 2014 - 20-20. Bonhoga Gallery 20th Birthday Exhibition. One of 20 artists commissioned to make an artwork related to its former use as a mill. June 2014 - Northlandings – Bonhoga Gallery, Shetland. Solo exhibition of Etchings, Sea boxes and Artist’s Books. Mar. 2013 - Sea Book and North Book purchased by the National Library of Scotland for their Contemporary Scottish Collection. 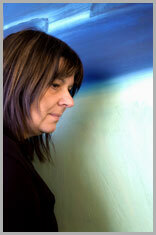 Feb 2013 - Image chosen for cover of Poet Jean Atkin’s new collection of work ’Not Lost Since The Last Time’. Dec. 2012 - Timelines- Ten group exhibition Gracefield, Dumfries. Aug. 2012 - Solo exhibition, Northlandings. Catstrand, New Galloway. Jun. 2012 - Spring Fling Open Studios. Jun. 2012 - Timelines- TEN group exhibition at Kelly Gallery, Glasgow. Feb. 2012 - Visual Artists Award for Bookmaking Master Classes. Nov 2011 - Two etchings selected for exhibition in Poland at Wroclaw Academy of Fine Art. Part of an exchange programme organised by SSA and Duncan of Jordanstone art college in Dundee. 2008 - Visual Artists Award for research trip to Iceland to create new body of work for solo exhibition in 2010. 2007 - Glentrool and Merrick Public art commission commissioned by Scottish Natural Heritage and project managed by DGAA. This project was commissioned to reconnect people to the landscape and took the form of a portfolio of etchings based on stories and memories from Glentrool and Merrick area. This was in collaboration with writer and poet, Mary Smith. Project launched in Summer 2008. 2005 - Visual Artists Award enabling research trip to North Uist to create prints for two-person exhibition at Gracefield Arts Centre in Nov 2006. 2003 - Elected Professional Member of Society of Scottish Artists. 2002 and 2003 - Scottish Arts Council Professional Development Funding, the latter being to attend an Environmental Arts course in North Uist. 2002 - Painting commissioned for Shetland Museum. 2001 - Three month Residency in Shetland Oct-Dec.
2001 - Residency in Donegal to create page for Great Book of Gaelic. My interest in printmaking lead to involvement with The Great Book of Gaelic Project, a collaboration of 50 Irish and 50 Scottish artists, poets and calligraphers creating a large contemporary book. At the moment it is touring internationally. 1999 - Monumental Miniatures for The Millenium. Commissioned by Scottish Touring Exhibitions Consortium. 1998 and1994 - JFM Purchase Prize Society of Scottish Artists.